Giveaways, sweepstakes, contests, raffles, and other game-style tools have been around for decades, but it’s only over the past couple of years that their popularity peaked among online marketers. And for a good reason, too: they are a convenient and cost-efficient tool which holds a major traffic and conversion growth potential for small and mid-size businesses. Raffles, contests, sweepstakes, and giveaways have a universal appeal in consumers’ eyes since they offer a fun and easy way to get cool stuff for free. For businesses, on the other hand, the smart marketing tools entail better visibility, scores of potential new customers, significant traffic and conversion increase, and notable lead database growth. But what’s the difference between these four tools, what are the biggest benefits of each of them, and which one is best suited to your business needs? How can we define giveaways? As a rule, giveaway is a blanket term used for any marketing campaign within which free merchandise is offered to potential or existing customers. Although it may seem as one of the least profitable advertising tools, giveaways actually hold immense value for branding and lead generation, which is why more and more growth-minded businesses use them to increase their competitiveness on the market. 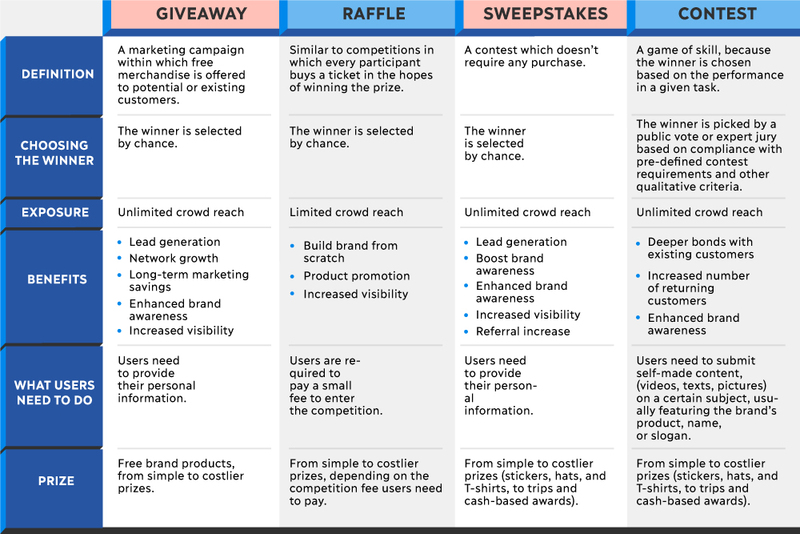 In digital marketing, giveaways are slightly different from contests and raffles which offer a chance for the participants to take smart prizes home, but also require partakers to take a certain action before they can claim their trophy. There are quite a few benefits your business can scoop from running an online giveaway, and they include easy lead generation, network growth, long-term marketing savings, and better product exposure in the public. Giveaways are a go-to marketing tool for easy lead generation and increasing the number of email subscribers. By allowing web-based public to have a go at your merchandise in exchange for their name, email address, and/or a few other bits of personal information, your business can increase traffic and sales in the long run. In this sense, giveaways function like hooks since they entice customers to make a purchase, and as such can be highly lucrative. For instance, Costco managed to boost their sales for certain products by as many as 100-600 percent with the help of free samples. Giveaways are a great way to grow your Twitter, Facebook, and Instagram communities, and they can help your business double or triple its follower crowd over night. On top of that, cleverly designed giveaways can help boost follower engagement on social networks and win over new followers by increased likes, shares, and comments. Running a giveaway on social media and other internet-based marketing channels doesn’t require extensive technical knowledge, which is why it’s a quick, simple, and relatively inexpensive way to boost your traffic, following, and conversion. On top of that, the costs of running a giveaway are predictable, which allows you to custom-tailor your long-term marketing strategy and budget plans. If you want to generate lots of buzz even before your business rolls out a new product, it would be a clever move to run a pre-launch giveaway. By featuring the new product as a giveaway, you’ll get to gauge market interest, fuel pre-launch excitement, and hopefully elicit feedback from early users. Successful brands know it already, so you can take their word for it. How can we define raffles? While giveaways allow users to try out your brand’s product for free (i.e. in exchange for basic personal info), raffles function like competitions in which every participant buys a ticket in the hopes of winning the prize. In this sense, a raffle resembles a lottery, but the key difference is that lotteries can yield a non-winning result, whereas raffles always have a winner. Namely, all purchased tickets participate in the final draw and the winner is randomly selected from a pool of tickets. In raffles, prizes are usually products (not money), and the draw is often organized to raise funds for charity, so the proceeds usually end up donated. Compared to giveaways, raffles usually attract a smaller crowd, but they can be efficient if you need to get your business off the ground, promote your product, or earn your brand a positive reputation, especially if the raffle purpose is charity fundraising. 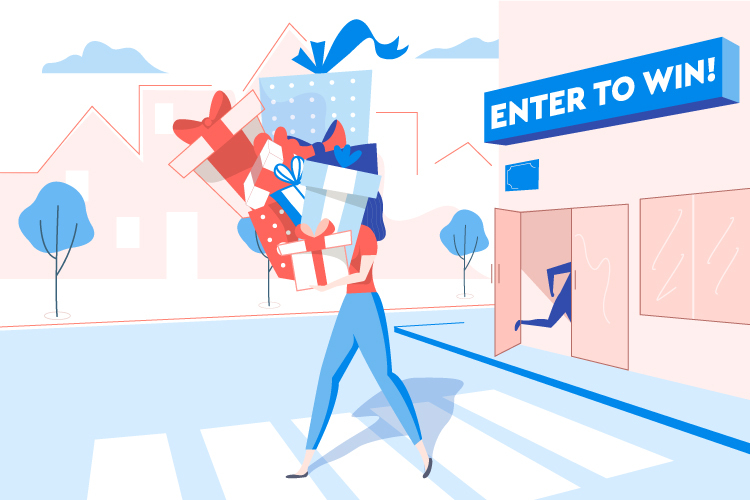 As a startup business, you can organize a raffle featuring your products as the prize and invite members of your local community to take part in the competition. Advertizing the raffle attracts lots of eyeballs on your business name and helps boost brand awareness on both real-life and virtual marketplace. Using your brand’s products as the raffle prize will allow raffle participants to experience various benefits by joining your customer list. If you can afford it, you can use a monthly product supply or annual subscription as the raffle prize: this simple marketing trick will show your target consumer crowd that you care for them and aren’t just looking to boost your profits quickly. Charity-oriented raffles are a fun, affordable, and highly effective way to build or boost brand’s reputation, and they can also make your brand stand out from the dozens of other, less charity-sensitive businesses in your niche. The positive buzz your business can earn by donating the raffle revenues to the less fortunate can (and usually does) go a long way in marketing and branding, so you’ll scoop up both increased visibility and positive brand name associations by a single draw. Raffles organized at specific times of the year such as Thanksgiving, Christmas, or New Year’s Eve are a smart way to keep your customers on their toes and turn an occasional buyer into a loyal one. Themed raffles have a considerable growth potential and can even become a tradition for families if the competition timing and advertizing are handled with due care. How can we define sweepstakes? Another clever marketing tool which in some respects resembles the raffle – we could define a sweepstakes as a contest in which the winner is selected by chance instead of skill. However, unlike the raffle, sweepstakes involve giving out prizes to randomly picked winners free of charge, whereas raffles traditionally require participants to pay a small fee to enter the competition. All the sweepstakes participant has to do is provide your business with personal information (name, address, email, etc.) for a chance to win a prize. If you want to max out the gains of your sweepstakes campaign, you can offer entries for various other actions like friend referrals, social media shares, or watching promo videos. As a rule, sweepstakes prizes range from inexpensive stickers, hats, and T-shirts, to costlier windfall, such as trips and cash-based awards. Handled with due care, sweepstakes have a lot of benefits for up-and-coming businesses, ranging from simplified lead generation and brand awareness increase, to reputation gains and a significant hike in referrals. Sweepstakes participants are required to provide certain pieces of personal information to enter the draw and your brand can use the data for outreach purposes. Email campaigns may be losing appeal over other online marketing tools, but you can still get a fair return on your sweepstakes investment if you make the follow-up email shine. As a cool bonus, high-performing sweepstakes allow you to get your hands on the contact details of a fresh pool of potential customers, so the odds of boosting your conversion rate will significantly increase. Advertizing your sweepstakes on social media, such as Facebook and Instagram, can grow your following and increase your brand’s visibility among potential customers. You can also use sweepstakes as a cost-efficient way to dial up product visibility or gauge market demand and interest in certain products or services in your niche. If you manage to get your crowd excited at the prospect of winning the sweepstakes, you may see a sudden spike in your brand’s following, shares, likes, and follower engagement in relation to the event. In the best-case scenario, the brand visibility boost will result in a one-time website traffic and conversion hike – and if the effects don’t work out as well as you initially hoped, at least it’ll be a short-term cost that won’t set your business back all that much. By encouraging sweepstakes participants to spread the word about your smart marketing move, you’ll bring home a significant (albeit one-time) increase in referrals. Getting your customers to post about your brand’s sweepstakes on social media in exchange for smart bonuses will help your business increase following, lead database, and visibility among target audience. How can we define contests? While sweepstakes and raffles can be labeled as games of chance, we would define a contest as a game of skill, because the winner is chosen based on merit, i.e. performance in a given task. Often used by established brands looking to boost visibility of a new product, contests invite the public to submit self-made content, such as videos, texts, or pictures on a certain subject, usually featuring the brand’s product, name, or slogan. The winner is picked by a public vote or expert jury based on compliance with pre-defined contest requirements and other qualitative criteria. Nowadays, contests are used by many famous brands, like Coca-Cola, Nike, and Dove, to deepen the bond with existing customers. However, they also entail a few other neat benefits, including brand visibility and community increase, interaction with end users, and creation of viral campaign content that will result in long-term traffic and conversion increase. Unlike sweepstakes and giveaways which aim to increase the lead database, contests are usually used to forge deeper bonds with existing customers and turn one-time buyers into returning customers. In addition to that, cleverly designed social media contests are a surefire way for your brand to win over new fans within a relatively short period of time, so if you don’t already have custom-tailored contests in your online marketing arsenal, it’s not too late to add competitions to the advertizing toolkit. Apart from helping you strengthen your ties with customers, contests also offer a simple way for your business to gather important information which can then be used to custom-tailor your marketing strategy in line with key sales funnel features. For instance, you can rethink your marketing channels based on the customer feedback or make changes in the production, advertizing, or distribution based on the suggestions voiced by existing users. Contests are a great way to spread the word about your brand and offering, which is why many successful businesses make a point of organizing competitions at regular intervals throughout the year. On top of its high value in terms of branding and product promotion, social media contests are relatively easy to organize and the budget can be customized in line with your marketing strategy. For a cool bonus, you’ll expand your lead database and reach a fresh pool of potential buyers who fit the description of your target audience. Viral content is seeing an all-time spike thanks to constantly growing popularity of social media, and there’s a highly effective way for your brand to use the trend to its advantage. By encouraging customers to create content for a contest, you get instant access to ready-made content which you can handpick and use in your future advertizing campaigns. And that’s not all: by featuring contest submissions in your advertisements and commercials, you’ll show your audience you appreciate their time and effort. This is a trait customers highly value in a brand, so don’t be surprised if your clips or ads go viral in a flash, giving your business a major leg-up on its quest for peak profits and market visibility. In the world of online marketing, a little gift can go a long way. If you’re not sure about the next step your business should take on the quest for superior visibility and profits, be sure to look into giveaways, raffles, sweepstakes, and contests. A quick, easy, and smart way to add appeal to your brand and earn bonus points of your audience, these four fun-oriented advertizing tools are a must-have for growth-minded marketers who like their conversion, traffic, and brand awareness high, and their customers happy and multiplying by the day. Good luck!